Michael Keane will come back bigger and better for being left out against Manchester City, according to boss Sean Dyche. The 22-year-old started 18 successive games for the Clarets, but veteran centre back Michael Duff was recalled on Saturday for the visit of the champions, and helped keep a first clean sheet in 15 games in a famous 1-0 win. Duff, who was awarded a testimonial on Friday after 11 seasons with the club, had been out of the side since November through injury and the form of Keane, but Dyche felt the time was right for the England Under 21 international to come out of the firing line. He said: “Keano has done absolutely smashing, he’s a young player who is going to improve and be a big, big player. “Part of his development is going in and playing, coming out, having a look at it and moving forwards. Keano has done absolutely smashing, he’s a young player who is going to improve and be a big, big player. Dyche also handed Sam Vokes a first league start in almost 12 months, with Michael Kightly making way, as Ashley Barnes switched to the left, and he explained: “We wanted a goal threat and felt he’d played there many times at Brighton, coming off the left, we know he works and plays hard for the team, and it worked reasonably well. “We wanted Vokesy to come back and be full on, ready to play, and he certainly looks closer, although there’s more to come. “All the tactical nuances of what we do, when we win, it’s a good decision, if you don’t, it’s rubbish. “It’s only the outcome that changes it, it could be a good decision even if you lost. 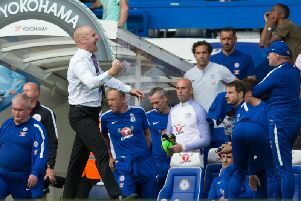 Meanwhile, after a mixed evening for referee Andre Marriner on Saturday, Dyche was in no mood to criticise the standard of officials in the Premier League: “I think referees have a really tough job, tougher than ever. The level of simulation I’ve seen in the Premier League is unbelievable. How tough is it now? I personally believe in retrospective banning. I tell you, simulation would disappear, no manager wants to lose their best players.